>Aromatherapy is a branch of herbal based medicine that makes therapeutic use of essential oils for health and well being. 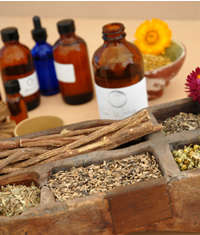 Aromatherapy is a rapidly growing, increasingly recognized holistic healing practice. Unfortunately the term aromatherapy has been so overused and trivialized that it is misconstrued as being simply the use of pleasantly scented products. While aromatherapy is generally dismissed as a serious option for healing here in the US, European countries such as France and England hold aromatherapy in much higher regard, using it as a natural medical therapy in hospitals and clinics. Aromatherapy is quite economical. Although the oils seem costly at first glance, they are so concentrated that only a few drops are needed to make an aromatherapy blend. Incorporation of aromatherapy into your medical care routine may help you lessen your dependence and dosage of costly pharmaceutical drugs. Personally as an arthritis sufferer, I have been able to cut down on pain medication to the point where the savings from that alone, pays for my monthly supply of essential oils. And I feel better too, and how do you put a price tag on that? Volatile plant oils extracted by steam distillation from flowers, leaves, roots, seeds and bark. Highly concentrated, fragrant oil, rich in chemical compounds of the mother plant. Volatile means the oils will evaporate and become airborne upon contact with air or heat. Aromatherapy and Emotions: One of the reasons aromatherapy works so well is that it works on both the emotional level and the physical level at the same time. Applying the oils to the pulse points so that the scent surrounds and comforts throughout the day is useful to balance emotions and reduce stress. Veins are close to the surface in these areas and warm the oil. Herbal oils like chamomile and lavender calm the mind and relax the physical body as well. Rosemary and peppermint lift and energize our emotions, while increasing circulation. The antibacterial power of lemon kills germs, while it's fresh citrus scent clears the mind. This dual action of essential oils is what sets them apart from chemical fragrances concocted in a lab that may fool the nose, but not the mind/body/spirit. And, by the way, once you experience the real thing those fake scents won't be able to fool you again. Aromatherapy Bath & Body :Don't be fooled by synthetics! Mainstream commercial aromatherapy products often contain inferior essential oils, or synthetic chemical fragrances that, while they may smell pleasantly, have no health benefits at all. In fact many are toxic. You can get the best value by buying quality, pure essential oils, and vegetable, nut and fruit oils. By following simple directions for use, make your own personal care, and home care products. You can get the best value by buying quality, pure essential oils, and adding them to basic bulk ingredients like baking soda and vinegar following simple directions. These homemade concoctions clean just as well as chemical products, with none of the unpleasant and dangerous toxins. Because aromatherapy oils are so easy to use, they are a great way to explore the use of natural plant based health. It is as simple as you want it to be. Aromatherapy oils can be used in many convenient ways to enhance your home and health. Essential oils are extracted by steam distillation from the flowers, leaves, roots, seeds and bark of many medicinal herbs . These highly concentrated, fragrant oils are rich in chemical compounds of the mother plant and form the basis of aromatherapy.